The Emerson NetSure 721 Series power system with 3500 watt or 2000 watt rectifiers and 1500 watt DC to DC converters provides up to 4000 amps of current for -48 volt systems with up to 520 amps at +24 volts. The basic components of the power system include the NetSure Control Unit (NCU), module mounting shelf assemblies which house the rectifiers and converters, and a modular distribution cabinet. It contains a powerful, microprocessor-based control system capable of monitoring and controlling up to 60 rectifiers and converters. The NCU controller provides a full color LCD display, which can be activated at the touch of a keypad. Each shelf can accommodate up to six plug’n’play rectifiers, which are controlled by the NCU. Additional shelves can be added as load requirements increase. The 2000 watt rectifiers and 1500 watt -48 VDC to +24 VDC converters are housed in shelves that occupy 1 RU. Each shelf accommodates rectifiers in all six positions and converters in three positions. 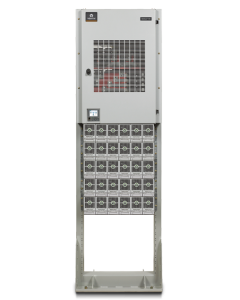 The NetSure 721 can be expanded to up to three distribution bays for a total capacity of 4000 amps and up to twelve distribution panels. Each NetSure 721 distribution cabinet is modular by row and position. NetSure 721 200 kW 4000 A -48 VDC 208 VAC to 277/480 VAC 84 in. std 23 in. Mounting 20.1 in 200 lbs. to 650 lbs.